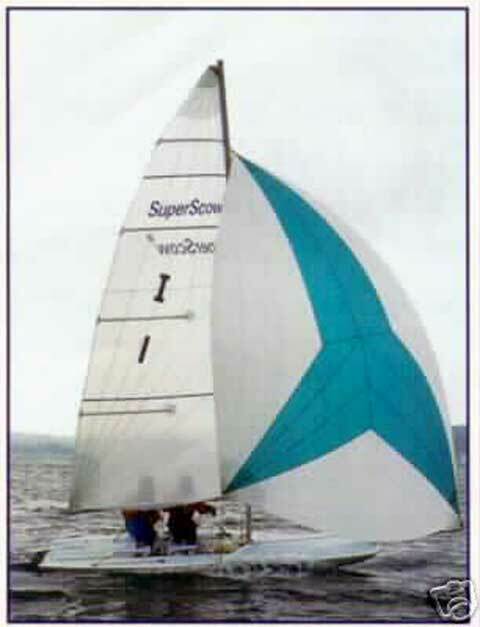 The SuperScow 16 was designed by Harry Melges III of Melges Boat Works in Zenda, WI. 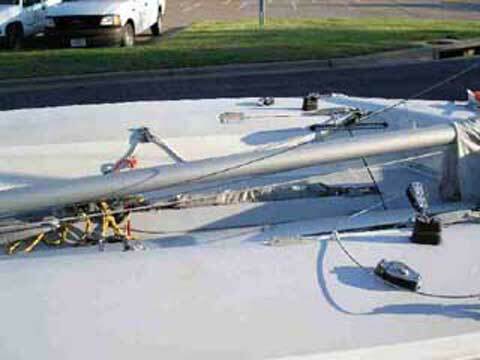 Melges has been building racing sailboats since 1944, and is currently one of the leading manufacturers of racing sailboats in the world, with its popular E Scow and Melges 24. The SuperScow has the legendary "scow" hull shape, with all its fast characteristics, and gives the sensation of an E Scow, without the need for all the crew. Basically, it is an MC scow hull with a Melges 24 style deck. Hull Features include a totally enclosed and sealed deck/self-bailing cockpit, mylar main and jib sails, roller furling for the jib, retracting bow sprit, asymmetrical spinnaker, twin elliptical bilge boards and rudder. It weighs only 350 lbs. and is equipped with Harken hardware. Sail area is: Main 121 sf; Jib 44 sf; and Spinnaker 210 sf. Spar height is 24 feet. Included is a mast-up, full-deck canvas mooring cover, nylon sail bags, and an older custom-fit trailer. Hull #126 is in very good condition, except for some very minor gelcoat crazing in the cockpit (not stress cracks) and a couple of very minor scratches in the hull. The deck gelcoat also has a few discolored spots which are a result of hardware having been relocated. The rub-rail that looks bent in the pictures can be straightened immediately by hand as soon as the straps are undone. The straps just pull the rubrail down when tigtened. The sails are also in very good condition without any tears. The mooring cover is somewhat weathered, but has no tears or patches, and has several more years of life left. The trailer is in very good condition, I towed it all the way from Indiana with no problems. It is very light, I still get 34 mpg when I tow it with my Civic. I bought the boat in Indiana about 2 years ago. Being in Indiana, the season was short, so the boat hasn't had much use. I only sailed it about a dozen times, only once in a regatta. I just have trouble finding crew, so I will just keep my old Laser. The sails, as said above, are in very good condition, I am including the original jib, main and spinnaker. The rudder is new, I bought it last year from Melges, along with a new tiller and extension. This boat is VERY fast, and when flying the spinnaker in a stiff breeze, the hull literally surfs on the water. With its light weight, it also performs very well in light air. You can single hand this boat very easily, and this includes handling the spinnaker too, in up to a moderate breeze. Spinnaker launch only requires pulling one line, the spinnaker halyard, that will launch the bowspirit and hoist the spinnaker. For retrieval you just pull the other end of The other amazing thing about this boat is the attention it draws, people are always coming by to look at it and ask questions. One big difference I found is the sealed cockpit, you can capsize the boat and righten it by yourself and it will self drain immediately. I have capsized older MC's and had to be towed back ashore, this is a huge improvement in convenience and especially safety. I have titles to the boat and trailer. The boat is at my house, in Bryan, Texas (about 90 miles north of Houston, 100 miles NE of Austin, 200 miles south of Dallas) and is available for a test-sail. Thank you for listing my boat. I finally ended up listing the boat on ebay, it did not sell either but I got a lot of interest. 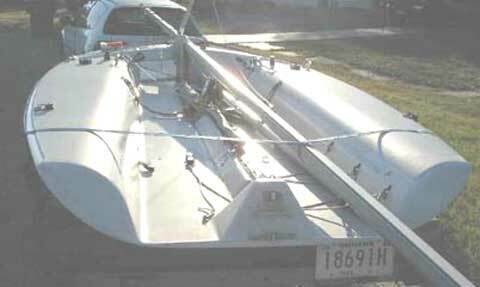 The person who is buying the boat saw the boat on your site and on ebay, so I do not know which one made the sale. I just got a deposit in the mail, so I would consider it sold. I really like your web site and appreciate your help. Where do you sail? I usually sail on the lakes in this area, Lake Bryan, Somerville, etc. I used to sail a lot on Lake Travis.